March Madness refers to the NCAA basketball tournament. For the first time in 15 years, HARTFORD is hosting the first and second set of games. This turned what normally would be a quiet work week into a week full of buzz and madness. We welcomed teams from the first and second round including Florida State, Vermont, Murray State, Marquette, Villanova, Perdue and Old Dominion. Hartford was full of activity and people and given how close our office is to the XL Center, we felt and participated in that energy! We started the week with a deep dive on Insurance Regulation from Drinker, Biddle & Reath. The content covered the basics of state-based regulations, federal regulations and laws, the role of courts and organizations such as NAIC and FIO. 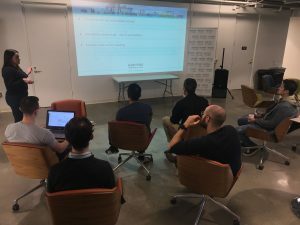 The discussion was led by Ben Seesel and Dan McCarty and the discussion concluded with how insurers and regulators will view InsurTechs from a regulatory and compliance standpoint. The excitement continued as we presented InsurTech trends to a group of Goodwin college students and their instructor Frank Sentner. This class was the first round of students in a program created with a partnership between Goodwin College and the Insurance Industry. The program helps prepare students for a career in Insurance. Congrats to Kate Bolduc and the team who are working hard to support the industry. To learn more about Goodwin College, follow the link. 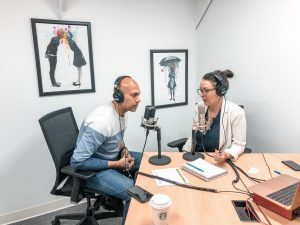 Each of startups attended a panel to learn about Media Relationships and then each completed a podcast interview with Carey Anne Nadeau for her podcast Profiles in Risk hosted by Insurance Nerds. 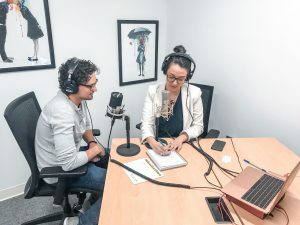 Follow us on our social channels for release dates of the podcasts. Our excitement continued with the arrival of our partners from Startupbootcamp Amsterdam FinTech and Cybersecurity. Michael Dooijes and Elizabeth Kleinveld focus directly on Cyber and we had an impressive line up of companies attending our lounge. Thank you to our attendees from our partners Capgemini, CIGNA, Travelers, The Hartford and USAA for attending our Cybersecurity Lounge. 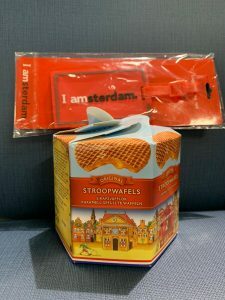 We kept up our energy but snacking on some Stroopwaffles – if you have never tried one, make sure you try the recommended way… over a hot cup of coffee or tea! We’ve heard they also sell them at Trader Joes – we may need to get some more! We continued with our cyber theme by hosting a cyber social that focused on third-party risk. The impressive panel included Elizabeth Kleinveld, the Partner Success Manager at Startupbootcamp Amsterdam, Bill Goodard a partner at Day Pitney and an instructor of Insurance Litigation and Insurance Solvency at the University of Connecticut, and Greta Geankopli, the CEO of Stratus Digital Systems a Privacy and Cyber Security Company. Great dialogue and questions arose with new ways to manage third party cyber risk with new methods from leading startups. Bill provided some clarity on what the process might be for startups doing business with an insured licensed in NY. If you missed our discussion from the cyber social, make sure to watch our video on Facebook. 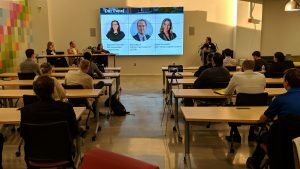 Alea, Hartford InsurTech Hub’s Marketing Manager, also conducted a PR and Journalism event. You may see our startups social activity increasing and if you would like to help them out, follow their social profiles, share and comment! 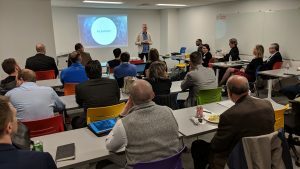 Pitch night was joined by Jess Inacio and Erron Smith (Connecticut Economic Resource Center, or CERC) gave some great insights on pitches and discussed how CT will support them if they are looking to set up an office here. 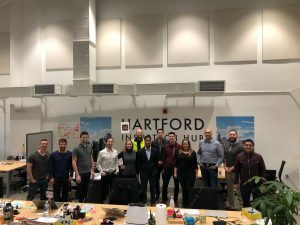 Hartford Stage was kind enough to welcome Hartford InsurTech Hub and the team to their production of Perfect Nonsense. We all needed a few laughs by the end of the week. As we finish our seventh week, we hope to see all of our supporters at our Demo Day on April 26th! Make sure to RSVP your spot now.